Do you remember wearing these when you were young? Weren't these a wardrobe essential back then? We believe the answer would be a big fat YES. The overalls have made a comeback, be it the shortalls, overall dresses or the classic ones. Fashion connoisseurs have been sporting this trend, so we thought-why not! Roseleen, 19 | I am a fashion admirer who loves to keep myself updated. 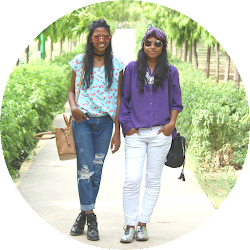 I have been eulogized by my friends on several occasions and one of them encouraged me to create a fashion blog, so I started the blog with my sister to show my personal style. It has been an arduous task. It demands us to take time off our busy schedule, a lot of planning in putting together the perfect concoction. I hope you guys liked this one. Bridgette, 23 | I was very anxious about my first post. I mustered courage, put on these overalls and went ahead. I was jittery. I had a million questions in my head. I was doing it, because I wanted to. My penchant for fashion has been there for sometime now. Giving it a platform was something I wanted to do for a long time. People would often compliment for the little trinket that adorned my ear or the strappy sandals that I had bought from Sarojini Nagar Market. I was once a tomboy. Baggy pants and loose T-shirts were my BFFs. Then came college and I realized it wasn't about those at all. I could do better. I switched those clothes with prettier ones and there was a new me. This is the new me in these high-rise suspender overalls and DIY (Do It Yourself) ballerina pumps. The golden goodies are part of a huge family of accessories waiting to be unveiled. We hope you like it. Comment below if you do (or don't).